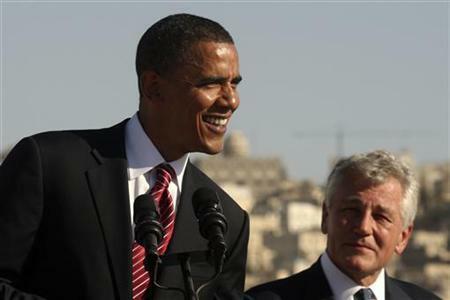 President Barack Obama is expected to announce his nominees for secretaries of state and defense in the next two weeks, with former Republican Senator Chuck Hagel on the short list of potential choices to head the Pentagon, senior administration officials said on Tuesday. Other top contenders to replace Defense Secretary Leon Panetta are believed to include former senior Pentagon official Michele Flournoy, Deputy Defense Secretary Ashton Carter and Democratic Senator John Kerry. Complicating matters, Obama is also deciding whether to nominate Kerry as secretary of state to replace Hillary Clinton, or to go with Susan Rice, embattled U.S. ambassador to the United Nations. Rice is a long-time confidante of the president, but picking her would lead to a tough Senate confirmation battle over her comments in the wake of the killing of four Americans in Benghazi, Libya. Kerry, chairman of the Senate Foreign Relations Committee, has coveted the job as America’s top diplomat and would face a much smoother confirmation process if nominated. It is unclear, however, whether he would accept the Pentagon post instead. If Obama nominates Kerry for State, he could the risk opening up a safe Democratic Senate seat in Massachusetts, which Senator Scott Brown, the Republican who just lost his seat to Elizabeth Warren, could run for in a special election. Obama’s choices for State and Defense will essentially set the tone for his administration’s handling of a wide range of global issues in his second term, including Middle East upheaval, Iran’s nuclear standoff with the West and efforts to wind down the war in Afghanistan. With candidates still going through the vetting process, Obama is not expected to unveil his choices before next week, but he has every intention of making his announcements before the end of the year, the administration official said. It is also possible that Hagel’s name was being floated to show Obama’s willingness to reach across the aisle, even if he ultimately does not nominate him. A social conservative and strong internationalist who co-chaired John McCain’s failed Republican presidential campaign back in 2000, Hagel might seem an unlikely pick were it not for his dissent years ago on the Iraq war launched under former President George W. Bush, a Republican. That war was the issue on which Obama also rose to national prominence. Hagel served two terms in the Senate, representing Nebraska, and left in 2008. He is a professor at Georgetown University. Since he left the Senate, Hagel has been a big critic of his own party. He told the Financial Times newspaper in 2011 that he was “disgusted” by the “irresponsible actions” of Republicans during the debt ceiling debate. Former President Bill Clinton chose former Republican Senator William Cohen to lead the Defense Department, and Obama kept Robert Gates, former President George W. Bush’s last defense secretary, on board for the first part of his term. Hagel has also been seen as a contender to take over at the CIA, where retired general David Petraeus resigned last month amid a scandal over an extramarital affair. CIA Deputy Director Michael Morell, who took over as acting director, and White House counter-terrorism adviser John Brennan are also in the running.